Take a look at the infographic below to see the trends that shaped the bridging finance market in the second quarter of 2017. “I am not surprised that the report shows increased lending figures, particularly in the non-regulated refurbishment market. Brexit concerns appear to restrict some lenders where higher lending refurbishments on larger value stock are required. “Although lending volumes are up on the previous quarter, the level of gearing still remains very modest and even down on the previous results. I think this evidences to critics who have said that the industry is using irresponsible lending practices and that gearing is available at levels that are too high, simply isn’t true. A majority, if not all this type of lending is also at interest rates fixed at outset so the borrower knows exactly where they stand. “Second charges are increasingly popular as borrowers want to hold on to historic low rate deals but can’t get the same lender to provide further advances. I think we have seen rates fall in the second charge market and lenders, such as Castle Trust, with specific products for this. “I believe the short-term lending industry will see increasing levels of refurbishment (light, heavy and full development). We are seeing an increasing trend of clients ‘bridging’ a transaction and then instead of moving the loan away, they are preferring to stay with the same lender to do the works based on the efficient and timely service they have received from the lender on the initial loan, even though the rates are higher than the high street names that continue to fall short of client needs and expectations. 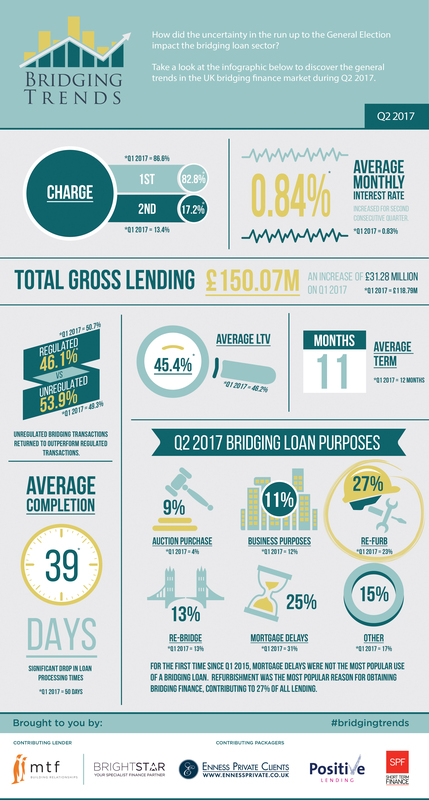 “Great to see the highest lending figure since reporting started in Q1 2015, which is fantastic news for the sector, which continues to grow in size with continuing high demand for short-term funds. “With the initial shock of Brexit last year and the General Election done, the market continues to thrive. The shift in use of funds from mortgage delays to refurbishment is not a surprise, as home-movers are most likely to be cautious when considering a house move at this time, with many parts of the country experiencing static house prices currently and concerns over buying at the peak of the market. “However, property professionals realise there are still some great property deals out there, especially when looking to increase the value of the asset via refurbishment. At Brightstar we have seen an increase in applications involving renovation and refurbishment and a huge increase in demand for development finance as well.